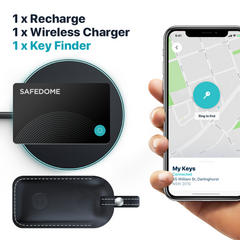 Combo pack with ONE Classic Safedome Card and ONE Premium Leather Key Finder Bluetooth Tracker. 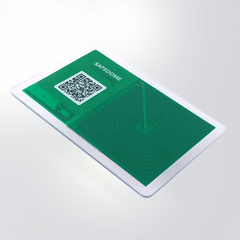 Safedome Classic, The World’s Thinnest Bluetooth Tracking Card perfect for Your Wallet, Passport, or Tablet. Find your misplaced items fast. Premium Leather Key Finder Perfect for Your Keys, Luggage, Bag or Backpack. Key Finder has Replaceable battery. Classic card is not Rechargeable.